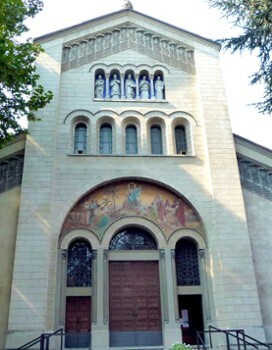 The facade has a loggia neo-Romanesque, five holes, with the statues of St. Stanislaus, St. Ambrose, Sant'Abbondio, St. Louis, St. Anthony and a wall painting in gold with "false mosaic". The interior has three naves. The apse and the presbytery, painted by Volonterio represent God the Father, Sant'Abbondio, Sant'Ambrogio, the Holy Spirit with the four evangelists, Peter saved from the waters and the multiplication of the loaves and fishes. 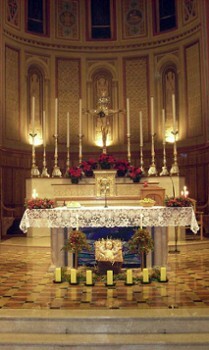 Volonterio are at the side altars (1927) with Anthony, Mary, Zechariah, the Deposition, St. Therese of the Child Jesus of Lisieux and St. Aloysius Gonzaga. The wooden choir dating back to the 40’s has veins and inlays made with chestnut wood of different colors; the chestnut was a typical tree of the slopes of Bisbino before disease reduced it to a few specimens. The stations of the "Via Crucis" come from Val Gardena and are the work of sculptor Christian Dellago. 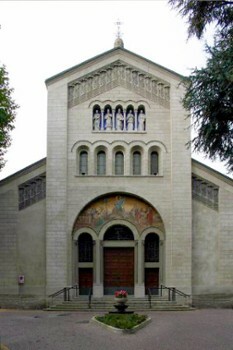 In the 20’s, the church was donated to the parish, while the surrounding land with the Avenue of Remembrance was left to the town of Cernobbio. In 1999, at the behest of the then Provost Msgr. Gino Ambrose Discacciati and project architect Joseph Altar, the entrance to the sanctuary was completely rebuilt, changing part of the original appearance. 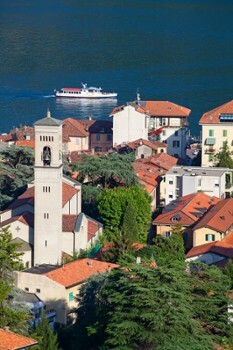 Nearby Things to Do include: Towns such as Blevio and Moltrasio; Water Activities such as Non Solo Barche Boat Rental and Lido di Cernobbio; Monuments such as Volta Lighthouse and Life Electric; Villas such as Villa Allamel and Villa Erba; Parks & Gardens such as Garden in the Valley and Villa Pizzo Gardens; Churches such as San Vincenzo and Santi Epimaco e Gordiano.